Hi guys, how's it going today? Wish I could tell you all that things are better, but I ended up getting a stomach bug. Figures. I eat entirely to much junk food, especially in order to get through swatch sessions. Eating is like my second favorite hobby after-all, haha. I'm looking at soup and lots of water for the next few days, not fun. But one thing that is all about fun is the collection I have to share with you guys today. Say hello to some of the gorgeous polishes from Frenzy Polish's Gamer Girl Collection. The Gamer Girl Collection by Frenzy Polish is available for purchase individually and in a complete set. This collection is composed of so many different finishes and shades, something for every kind of gamer girl. 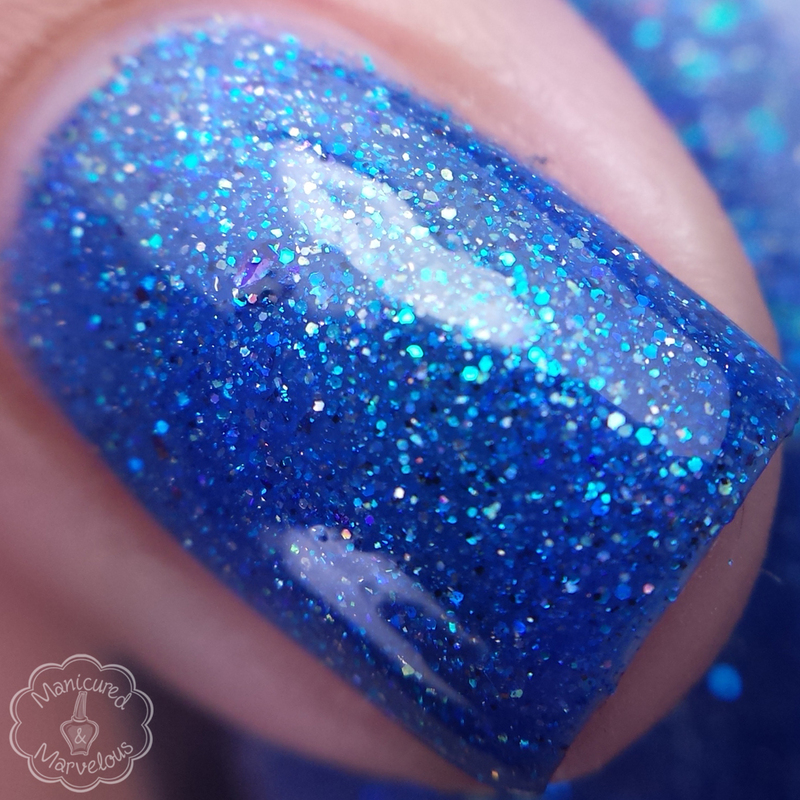 Blue Screen of Death is a slightly tinted blue base with loads of blue glitter, sparse black glitter and flashes of lighter blue and holo mixed in. This polish also glows bright blue in the dark! Unfortunately because I am a goof I didn't take any photos of the glow shot. I'm definitely going to be re-swatching this and making sure I nab the glow! Such a sparkly and beautiful shade. Formula was a bit thick, but extremely manageable and not a problem when layering. It dries to a slightly textured finish, but smooths out perfectly with just one layer of topcoat. Shown here in two coats. EPIC is a medium purple crème with multi-colored flakies. It's such a stunning and unique shade, definitely don't own anything like it. The flakies add a really subtle definition to the finish. Formula has a great consistency, not too thick or too thin and is surprisingly opaque. Shown here is two coats sealed with a glossy topcoat. LAN Party is a clear glitter topper full of neon glitters of various sizes, random neon yellow stars and sprinkled with holo micro-glitter. I paired it here with Essie's All Access Pass as a base color. The color combination here is so wild and not to mention fun. Formula has a good application with the majority of the glitters, but you will have to fish a bit for the star-shaped ones. Other than those however this polish has ample glitters with each brush stroke. Shown here is two coats over my blurple base choice. /ragequit is a blackened maroon base with various sized blue and red glitter & flakies. I love the dark base combination with the bright glitters. I happen to rage a lot when it comes to video games so I admittedly have some extra love for it haha. Formula was pretty good with super smooth application throughout. It did apply sheer and streaky at first, but it evened out perfectly with each layer. Shown here is three coats sealed with a glossy topcoat. Overall I am more than impressed with my first time out with Frenzy Polish. The collection has a real taste of uniqueness and fun about it. Whenever I am not playing with polishes, I'm on World of Warcraft gaming it up so this collection was instant love! The recognizable gamer lingo for the polish names was one of the major drawns for me. I'm definitely interested in seeing future collections from this indie brand! Which one is your favorite guys? Just saw your swatch of it too! It's definitely a beauty. I'm no gamer, but I like these! That's the best thing about this collection, gamer or not you can't deny a gorgeous polish lol. I have Blue Screen of Death and a few others from this collection and they're so pretty! I'm really liking Frenzy Polish right now. :0) Beautiful swatches! Blue Screen Of Death is everything!!!! These are all beautiful, especially /ragequit! I'm loving everything I've seen from this brand so far!! Blue Screen Death is absolutely gorgeous! Epic is my fav, but they are all gorgeous! Beautiful swatches! /ragequit is all sorts of amazing <3. I never /ragequit because all I play are Lego games, lol! Great swatches! These polishes are all equally pretty! Pretty colors! I can relate most to blue screen of death! I like how /ragequit looks best of all! I was just browsing Frenzy Polish the other day and just couldn't make up my mind if I should buy anything or not. These are definitely unique! I love EPIC! Great post! I really want to get EPIC and I love /ragequit too! I do have some Frenzy polishes and love them! The only one that I have from the gamer girl collection is wanna role play. Thanks for sharing.